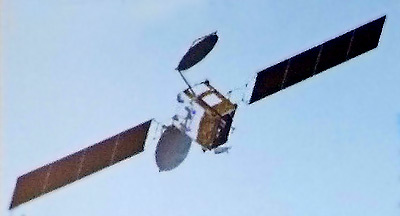 The AngoSat 1 is the first communications satellite built for Angola. The Angosat Project Contract was signed by the Russian and Angolan Parties in 2009. In the following years both parties carried out a joint work in organization of the project financing, that made it possible to proceed to its practical implementation. Work on the satellite started in late 2012. The Angosat Project calls for development of a communications satellite with C- and Ku-band transponders, its launch into a geostationary orbit and development of the ground communication and TV broadcasting infrastructure. The Mission Control Center and Central satellite communication network station are planned to be built in the suburbs of Luanda. Moreover, the Project provides for activities on improvement of the currently exciting ground segment of satellite television broadcasting system of the Republic of Angola. AngoSat 1 is based on RKK Energiya's USP Bus of Yamal-heritage. Airbus Defence & Space provides the payload. The satellite is designed for direct insertion into the geostationary orbit by the launch vehicle upper stage and therefore does not feature an apogee engine. The satellite was contracted for a joint launch with the Energiya 100 satellite on the Zenit-3SL (2) in 2016. Due to the Ukraine crisis, the availability of the Zenit launch vehicle had become questionable. As an alternative, a launch on the second flight of the Angara-A5 Blok-DM-03 rocket was selected. Eventually, the satellite was moved to a Zenit-3F rocket for a December 2017 launch from Baikonur. The satellite was successfully launched on 26 December 2017 directly into geostationary orbit. Contact was established with AngoSat 1 after spacecraft separation, but contact was lost subsequently during solar panel deployment. Contact was reestablished a day later, but the status of the batteries remained worrisome. The satellite was afterwards allowed to drift westwards to its orbital position at 14.5° East, but the drift did not stop there on 9 January 2018. A few days later, it was disclosed that a electrical power system issue arose and it was chosen not to undertake any maneuvering attempts. Due to the drift, AngoSat 1 left the communications range of the mission control center in Korolev. Attempts to contact and stabilize satellite on its intended orbital position were to be attempted in April 2018, when it reentered communication range, but the satellite was not responding. It was considered lost and a replacement, Angosat-2, is under negotiation for launch in 2020.